For more than thirty years (I'm counting his earliest submissions to The Dr. Demento Show too) "Weird Al" Yankovic has influenced culture just as much as he's parodied it. Sometime next year will come his thirteenth studio album. And while we're waiting for it, I have to recommend that you run out and buy (but don't illegally download, you hooligan!) The Essential "Weird Al" Yankovic: a fantabulous two-disc set of 38 songs, all terrifically remastered, spanning Al's professional career. The Essential "Weird Al" Yankovic is a musical odyssey not just of Al's career, but even of modern civilization... after humorous fashion. This is no mere compilation album, though each song is certainly a classic. But The Essential "Weird Al" Yankovic must be appreciated as a monumental work in its own right. This set is absolutely a serious study in the beginning and development of a true musical artist. And not just Al either: his entire band - Jon "Bermuda" Schwartz, Steve Jay, Jim West and Rubén Valtierra - gets spotlighted for their talent in the liner notes. These guys have been wildly successful for three full decades and are now primed to enter their fourth with no end in sight. How does that happen? Listening to The Essential "Weird Al" Yankovic, the lesson is clear for any who endeavor to succeed: do what makes you happy, but don't be afraid to grow and change. Because that is a virtue that I doubt will go without respect upon listening to this album. Playing it all the way from "Another One Rides the Bus" (Al's 1980 debut on the charts) on through "Trapped in the Drive-Thru" (the parody of R. Kelly's "Trapped in the Closet", from 2006's Straight Outta Lynwood) one can't help but hear the maturing of Al as both singer and songwriter. It's a quality that, I hate to say, isn't embraced as fully as it should be by too many in the arts and entertainment industry. I'm not going to "name any names" here, but I will comment that in my long-considered opinion it's much of the reason why "Weird Al" Yankovic's career has never waned, and indeed has only continued to find new fans even while maintaining the many faithful that he has already accumulated across thirty years and more. As I said, there are 38 songs filling up two discs of The Essential "Weird Al" Yankovic, including the extra gory version of "The Night Santa Went Crazy" and "Albuquerque" (Al's longest song to date, running more than 11 minutes). The set is about evenly split between Al's parodies and his originals, among which number some of his finest and funniest works, such as "Dare to be Stupid", "Don't Download this Song" and (one of my all-time favorites) "Trigger Happy". Of course, the songs likely to be played most often are going to be the parodies. And I'm happy to report that most of the classics are here and sounding better than ever! "Eat It" and "Fat" are naturally part of the album. You'll also be glad to know that "Like a Surgeon", "Smells Like Nirvana", "Amish Paradise", "White & Nerdy" made the cut, as did "Jurassic Park" (only Weird Al could have taken Richard Harris' "MacArthur Park" and turned it into a song about rampaging dinosaurs). The one song that's not in this compilation that I wish had been included was "Couch Potato": Al's spoof of Eminem's "Lose Yourself". But then again, Disc 2 was already crowded enough with "Albuquerque" and "Trapped in the Drive-Thru", so that's likely just a quibble about technical issues. 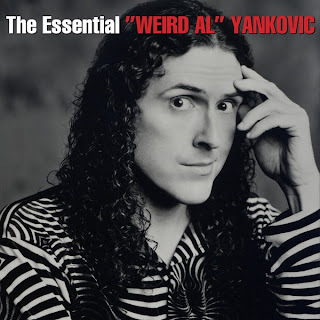 I'll wrap this up by saying thusly: that The Essential "Weird Al" Yankovic is a MUST-have album, whether you have just discovered Al's music or are a longtime fan. And, echoing the sentiments of the interior notes written by NPR Music's Stephen Thompson, this collection exemplifies why Weird Al more than deserves to be inducted into the Rock and Roll Hall of Fame... along with finally getting a star on the Hollywood Walk of Fame. If you only buy one CD this year, make it The Essential "Weird Al" Yankovic. And if you only buy six CDs this year, buy six copies of it! I will most definitely be picking this up next pay day...was looking at it the other day at wal-mart and it looks absolutely fantastic! I am now looking forward to it's delivery.